Yo! What's the haps? : I love to write letters. A lot. So I will write one right now. I've had just about enough of you. You are always there. Anytime I walk into a business that is trying desperately hard not to offend anyone by way of music, you are there. When my mom is driving me somewhere in her minivan, you are there. When I am at work, you are there. It is much worse when you are at work because it is not so easy to escape you, as a vital part of my agreement with my employer is that I not run out of the building 7 times a day. What is your problem? Do I come to your workplace and sing warbly soft lyrics into your ears? No. 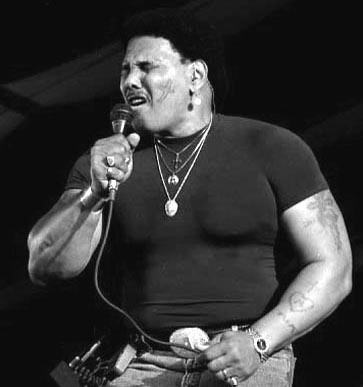 No I do not, Aaron Neville. So why do you do it to me? Your actions are without justification, and I will not stand for it any longer. What does that mean? I'll tell you what it means. I don't know if they use the same lingo in the big easy, but basically that means that should we ever meet face to face, you are in a whole new WORLD of trouble. So go on. Go plague somebody else. Linda Ronstadt just called. She totally misses you. But if you go visit, you better NOT record any new material. Not if you know what's good for you. You know, I was trying to think of a way for us to work this out. And I thought of one. But since you cannot magically transform yourself into Herb Alpert and the Tijuana Brass and play "A Taste of Honey", I don't think it's gonna happen. PS: I don't terribly mind your brothers. They seem like okay people. Possibly because they play instruments and DO NOT SING IN A VOICE THAT SHOULD ONLY BE COMING OUT OF THE MOUTH OF A 5 YEAR OLD GIRL. Look at him. He even carries his mic to go mountain biking. What a douchebag. Hand gestures in photos, dead giveaway. Idiotic tattoos are a blatant sign, these include but are not limited to: barbed wire, native and chinese symbols. Side-tilted hats, and sleeveless shirts are a harbinger of douchebagginess also. If you get your fashion tips and hair style by watching "Growing Up Gotti"
Upturned collar? Mini Jesus bling? Shaved and oiled chest? You're most definitely a Douchebag. Props to all those at Hot Chicks With Douchebags for the definition. But he wears shirts that are OBVIOUSLY way too small to contain his massive torso. And he sings like a girl. And he holds the microphone oh-so-delicately. And he is stalking me, musically speaking. 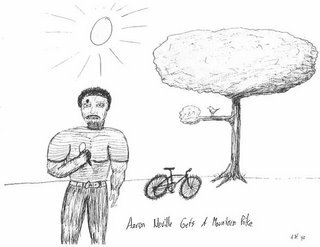 Therefore... Aaron Neville is a douchebag. I hope you like Aaron Neville because I think Platypus wants to marry him. Enjoy your time with your new relative. PPS: You look here and tell me he is not a douchebag. Note the tattoos. Still can't call him a douchebag. Sure he has tattoos, but no self respecting douchebag would tarnish their self-proclaimed, oh-so beautiful mugs with one as he has. So what does that make Miss Neville? A freak of nature? Absolutely! Oh, oh. What's this here? Looks like it might be a 'side-tilted hat' of sorts. If Platy's theory is correct... I think I'm smelling some Summer's Eve.